When I first started making yoghurt I was using the Thermomix to make it in, purchasing a pot of natural yoghurt to start each batch. Then I discovered yoghurt culture, a much cheaper alternative. One of the problems with the methods I was using was that the yoghurt was either too runny or was stringy (left long strands/drizzles as you spooned it.) I have done a lot of research, changed the recipe and finally this is what I came up with. It is now the only way I make my yoghurt. It is delicious and creamy, and very economical. 3 drops calcium chloride diluted in 1 tbsp of non-chlorinated water. Place the full cream milk into the mixing bowl. If using fresh milk from the refrigerator section, heat your milk to the bowl and heat 10 minutes/90˚C/speed 3, then allow to cool to 40˚C. Add the calcium chloride and water mix, yoghurt starter culture and powdered milk. Using the 'Automated Recipes' select the natural yoghurt recipe and flick through until you are prompted to 'Turn speed selector to start'. 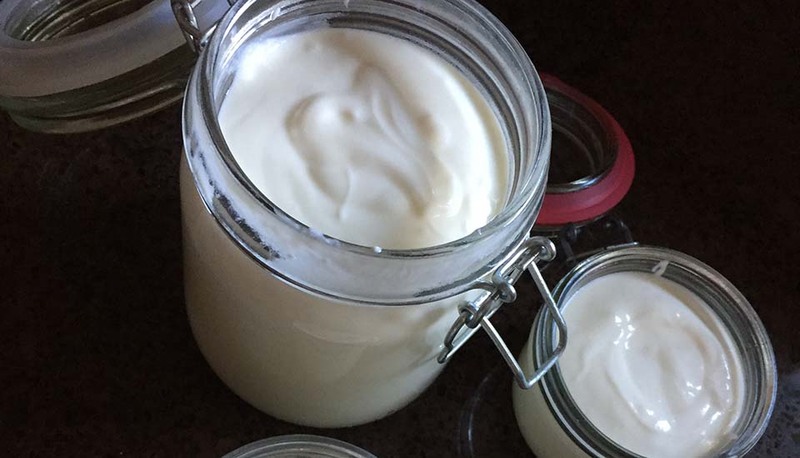 Transfer the yoghurt to glass jars, cover and leave on your bench for an additional 8-12 hours. If using fresh milk from the refrigerator section, heat your milk to 90˚C for 8-10 minutes, then allow to cool to 40˚C before adding the yoghurt starter culture. Mix in your powdered milk. Mix in your calcium chloride. Mix in your yoghurt starter culture, mixing well to ensure the culture is evenly distributed throughout the milk. Maintain the temperature for a minimum 8 hours. (12 to 24 hours is recommended). Long life or UHT milk does not need to be heated to 90˚C, as it has already been treated. For best results, ensure your milk is between 37˚C and 43˚C when you add your yoghurt starter culture. If you use store bought milk the addition Calcium Chloride helps to re-balance the calcium content of milk, as the manufacturing processes decreases the calcium in the milk, thus affecting the clotting properties.